When was radium discovered? Who are Dmitri Mendeleev and Glenn T. Seaborg? Who discovered uranium's radioactivity? Which element is useful for dating the age of Earth? And why doesn't gold have a scientific name? 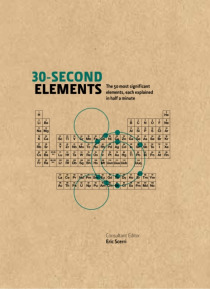 30-Second Elements presents you with the very foundations of chemical knowledge, explaining concisely the 50 most significant chemical elements.This book uses helpful glossaries and table… s to fast track your knowledge of the other 68 elements and the relationships between all of them.